sailboat. : GIVEAWAY: Love Hearts & Crosses necklace. I am so SO excited to be holding this little giveaway & the prize is one of the Brown Bunny Necklaces from Love Hearts & Crosses. If I'm being honest I would very much like to keep her for myself, but I know she'll find a lovely new home with one of you! 1. You must be a 'follower' of my blog! 2. Have a look at the Love Hearts & Crosses website & let me know in a comment what your favourite piece is. 3. Don't forget to leave your email address or twitter name too just so I can easily get in touch with you if you win! 4. To enter, please comment only on this post! And that's it! Good luck! There will be one winner, chosen at random via something like random.org. The giveaway is open internationally, if I can ship to your country, you can enter! You can enter any time within the next two weeks & this giveaway will close at midnight GMT on Saturday 16th February 2013. Please enter only once. Ahhh I absolutely love this! I have a couple of druzy rings from Love Hearts & Crosses, they are gorgeous. I've seen this necklace on the website, it is too cute. The website won't load for me at the moment :( But I do love all the druzy rings - have spent a lot of time drooling over them in the past haha. My favorite piece is.. Red Mini Woven Messenger Handbag gorgeous!! I love the crystal star ring - so cute! Aaw bunny! There's so many lovely things on their site, but I love the Alice rings and necklaces! The baby bear necklace too - how cute! 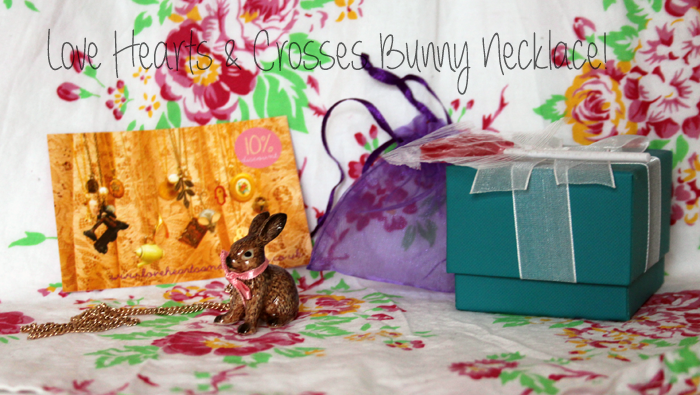 Oh I love your posts and wish you win your cute Brown Bunny Necklaces from Love Hearts & Crosses!!!! Oh my gosh!!! yes yes please! i am in love with this. I actually think it is my favourite piece from the website. I do also love the fox necklace, the alice in wonderland rings and the flower garlands! Both are so so cute! This is so adorable! Love everything on the website, so quirky! But favourite but have to be the black acorn necklace! Gosh I loved the "Bitten ice-cream" necklace! There's so much prettiness to pick from, I love the rabbit necklace though. It's stunning, so kitch and vintage, and a necklace...perfect! wow that is an amazing and cute giveaway! the alice in wonderland necklace is definitely my fave :) . The bitten icecreAm necklace is so cute! The bunny is so cute! My favourite piece is the Gold Infinity Ring, I've been searching for one for ages, it's so pretty! The Antique Gold Statement Collar Necklace is my favourite, I think this would have the power to make or break an outfit! My favourite piece is http://www.loveheartsandcrosses.co.uk/shop-jewellery/brooches/danecraft-vintage-animal-brooch.html because it's got a lion on it and my star sign is Leo and I love Cats. their stuff is so beautiful! my favourite piece is the gold gliding swallow bird necklace (http://www.loveheartsandcrosses.co.uk/gliding-swallow-necklace.html) because it fits perfectly to one of my bracelets, exact same swallow!! I think my favorite thing would be the bunny or the Alice in Wonderland necklace! :) My email is aly_wonderlandbeauty7@yahoo.com and twitter is aly_wonderlandb! Oh my she is pretty!! I love their rose gold stacking rings with the different coloured stones. So pretty! i have literally been looking at the website for hours! so adorable! I'd choose the skull princess necklace as it looks rather cute but its got an edgy side to it as well, i love it! Ooh how sweet! My favourite piece is deffo the black crystal evil eye bracelet, everything on this site is so dainty and sweet :) can feel the bank account sighing already! They have such beautiful exquisite stuff, I personally love the "Brown Bunny Necklace" from their website or the "Braided Leather Feather Headband Wrap"..
wow, I love everything! seriously I'm not often blown away by pretty jewellery but I've bookmarked the page because I'm defo gonna buy some bits. I LOVE the antique blue cabochon ring. The colour is gorgeous. That necklace is so cute, my favourite item on the website is the large pug necklace. My favourite piece is the Alice & Flamingo necklace - it's my favourite illustration from the book! I like the bird cage necklace! The whole site though is adorable! I follow you through GFC :) I really love the Black And Gold Beaded Leather Wrap Bracelet! What a cute giveaway!! I follow your blog already, and my twitter is ellalogy! I absolutely love the pieces with infinity signs and the letter stackable rings! I adore the Alice & Flamingo necklace, it's beautiful. The Alice and Flamingo necklace is magic. My email is s.r.d.123@hotmail.com and my twitter is SumSugarPlum. Oh my god please be mine! This is definitely my favourite piece. My favorite piece is the Vintage Owl Brooch as it remind me of my grandmother before she died. What a fabbb giveaway! The necklace is gorgeous! They have such lovely quirky pieces, but my faves are the Dark Juicy Cherry Earrings, I think I may have to purchase! I really love the pyramid triangle collar necklace in rose gold :) thank you for the giveaway! I loveee the Red and Gold Box Chain Ribbon Bracelet! I just got FAR too excited to see this giveaway! 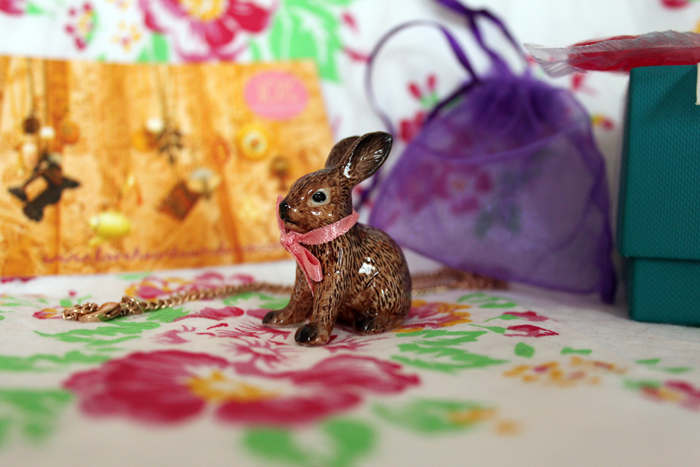 Jewellery and a rabbit, what more could a girl want! I love the Cuckkoo-Cuckoo clock Necklace, it's so cute! Nice giveaway! =D I follow you on GFC and twitter. My favourite piece would be the enamel chasing bunnies necklace- very cute! That rabbit is TOO cute! I love animals or flowers and decide that the silver stacking ring in flower is my fave. Oh my goodness what a beautiful necklace! I really love the Alice in Wonderland White Rabbit Ring, its really cuteeeeee!!! My favourite piece is Gold Little Wishbone Dangle Earrings. Love this necklace and the Alice and the Flamingo Necklace! Lots of gorgeous things on the site, might have to leave the laptop open on the page as a hint to hubby!